A blog about climate change wouldn’t be complete without a post on Obama’s climate speech that he gave today at Georgetown University. First–to make sure that we’re all on the same page–here is a link to the video of the speech, and here is a link to the full transcript. If you’re better at visual representation, click on this to see an infographic from TckTckTck on the President’s Climate Plan. My overall reaction: I was surprised (in a good way) about the speech. I’m used to vague promises that I expect to die once they’re spoken. But, in classic Obama style, the speech gave me hope that these proposals will become reality. There were also two HUGE pieces in the speech (Keystone and divestment…see below) that had be jumping out of my chair. I was disappointed by his stance on natural gas, but the conclusion: even though there are parts of the speech that we may disagree with, other parts have shown that the climate movement has the power and respect to command the attention of the political process. Keystone XL does contribute to climate change because tar sands is a “carbon bomb,” so hopefully this means that Keystone will be rejected. Let’s be real: it was the climate movement, individual voices, op-eds, rallies, and conversations that transformed Keystone from an unknown matter to a moral decision with climate implications. Who would have guessed or dreamed–but Obama endorsed divestment! This meme says it all. 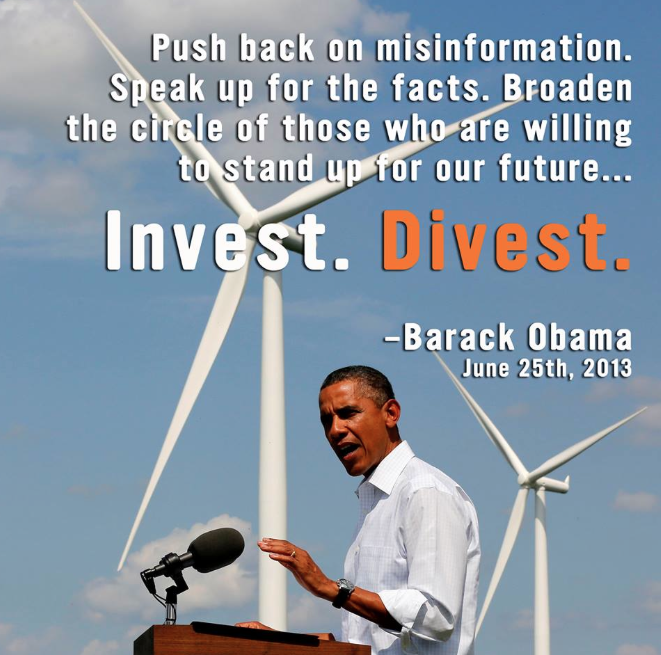 Right from the POTUS’s mouth: divest. If Obama is calling on the nation to divest, how can our institutional leaders continue to look the other way? And, like above, it is 100% pure grassroots people power that catapulted divestment from a few nascent campaigns to a President-worthy idea in under one year. This is an unfortunate part of Obama’s climate plan. Natural gas can’t be seen as a bridge fuel because the destructive extraction processes and the fact that–inevitably–it is still a fossil fuel. Furthermore, if we phase out oil and coal, we are left with a huge natural gas industry that will look less and less like a transition. Ending subsidies to Big Oil is essentially like the government divesting from Big Oil–refusing to support their business-as-usual. When this is acted upon, it will send a very loud and large message to investors and those in the industry that a) oil is not a good investment anymore and b) we should not be condoning these companies’ practices. Obama recognized climate change as an existential and moral issue. I am glad that he sees it in this light; this is about today, tomorrow, everyone we care about, and everything that we love. Obama gave a strong speech. It wasn’t perfect, but–as evidenced by the references to Keystone XL and divestment–we know that we have the climate movement to push for change in our political system. Now is the time for Aristotle’s “virtue of though” to turn into “virtue of character:” thought to action, rhetoric to reality. Right now I am hopeful that this is the platform for the transition towards a different energy economy. But one thing we know: our social movement is powerful, and it’s working. We can’t stop now.